Great storytelling has kept viewers coming back to Supernatural year after year. The cast never misses a chance to share the love with their fans at a convention. They’re regulars at San Diego’s Comic-Con, where attendees had a chance to learn what, and who, to expect during their 12th Season of Supernatural on The CW. The panel was moderated by the Kings of Con team of Richard Speight, Jr. (Gabriel) and Rob Benedict (Chuck Shurley/CarverEdlund/God). The 2016 Comic-Con panel featured new showrunners Robert Singer and Andrew Dabb, and stars Jared Padalecki (Sam Winchester), Jensen Ackles (Dean Winchester), Misha Collins (Castiel), Mark Sheppard (Crowley), Samantha Smith (Mary Winchester), and Ruth Connell (Rowena). The panel was the last in Hall H for this year’s San Diego Comic-Con, taking place on Sunday, July 24, 2016. When asked how the series will follow the return of God and his sister Amara in Season 11, Robert Singer noted, “You don’t get bigger than God.” The focus during Season 12 will be telling smaller stories, including “some good old-fashioned horror.” As well as Monster of the Week storytelling, the series will explore the British Men of Letters, the disappearance of Lucifer, and the return of Mary Winchester. 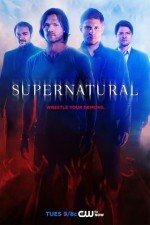 With the sudden appearance of Mary Winchester, how will the boys respond to her return? Jensen Ackles noted that “the children that she knew are now men.” They have to bridge the gap of the last 30 years. How will she get involved in their lives? Ackles suggested that based on the Winchester history of taking extreme action to protect family, that her presence could make the brothers more vulnerable. With Mary’s return, Supernatural returns to its core theme of family. Andrew Dabb pointed out that Mary has been mythologized and that the boys don’t really know her. When talking about what she hoped for her character this season, Samantha Smith would like to see, “Anything except the perfect mom persona. Everything else is open because that’s all there’s been… Just being a person, a fully actualized person.” Mary was raised like a hunter and Ackles is eager to see “the hunter side of Mary”–how she deals with the supernatural and how it compares with how Sam and Dean approach hunting. There’s been a hint that Crowley’s family will return but on an expanded scale. Not only will mummy Rowena return in Season 12, but so will son Gavin. Ruth Connell commented, “I don’t think Rowena knows that she’s a grandmother…. I’m not sure she’s not ready to be a glamorous grandmother just yet.” Rowena will be changing her path from last season. According to Dabb, Rowena has made some big moves trying to be the power behind the throne, but in Season 12 she’ll take a step back. As for Crowley, he’s still not the King of Hell and the series will explore what he ultimately wants. Dabb noted, “Crowley’s relationship with the guys has evolved very nicely over the course of the last two seasons. We want to keep that going.” Singer joked that at least once a week Mark Sheppard asks, “Are you killing me yet?” Fortunately for Sheppard, and viewers, we can expect to see a lot of Crowley in Season 12. Since being expelled from Castiel, Lucifer is looking for a vessel, but he needs a strong one. Lucifer got what he wanted last season – one-on-one time with dad. Dabb explained, “For him he’s kind of out in the world. Ruling heaven, ruling Hell, lacks appeal. We’re seeing Lucifer as kind of on vacation and he wants to have some fun, but he realizes is that when your name is Lucifer it carries a certain amount of baggage.” The first vessel he feels comfortable in is an aging rocker, played by actor/musician Rick Springfield. Dabb was asked how much of the Season 10 episode “Fan Fiction” was based on real fan fiction. Dabb stated that though it wasn’t based on a specific fan fiction, it was based on what they’re aware of because of their fans. He described the episode as a tribute to the fans. To see the panel, watch below. I noticed that I don’t often reblog stuff to this site. Well that’s it. I’m gonna start. When er I come across Supernatural news on other WordPress sites, you guys are getting an eyeful And please remember, if you like a post, visit the blog where it’s from, give it like, or subscribe. It’s good to support all our Supernatural fans! I loved this panel, can’t wait for season 12! !